The votes are in and UK has decided to leave the EU. While as the final votes were still being announced, the market already started to sell off once it was evident that the lead of the leave camp was unstoppable. The sell off in the major equity indices around the globe declined along with fall in the GBPUSD. DAX, S&P 500 and Nikkei was sold off along with FTSE 100, no region was spared. The pound made its 2016 highs and lows in a single day. The round trip move in the currency was the largest daily move in its history. The result was a narrow win for the leave camp at 52% vs 48% to remain. It can be seen as the working class pitted against the city elites. One of the interesting demographic of the voter intention highlighted that the majority of the young voted for remain while the older generation voted to leave. From the economic perspective, it is undeniable that the UK GDP will smaller as result of going it alone. HMS Treasury provide a detailed economic modelling on this issue. As we noted in our note on the Euro, we consider the ultimate decision for the UK to leave EU as a political decision. Our original prediction was for the remain camp to win the referendum. However given the increasing number of polls showed voters were leaning towards leaving, the risk of leave actually wining eventuated. The market was caught off guard as the remain result was essentially priced in. There will be considerable volatility as the fringe nationalist parties across Europe take note of the result and call for their own referendum on their own countries future role in Europe. We consider the fall in the British pound as the start of broader trend. The result of the referendum is just the beginning of the new phase of greater uncertainty. While UK’s decision to leave is the main question asked. The result of the vote count raises another just as important question on the future of the United Kingdom it self. The decision to leave is determined by the total votes for and against leaving the EU. 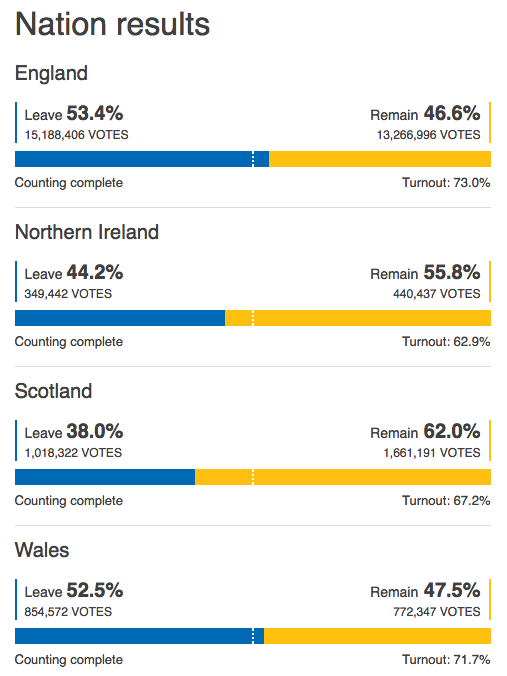 However the breakdown of individual country’s votes shows that Scotland and Northern Ireland overwhelmingly voted to remain in the EU. First Minister of Scotland has already signalled intention for a second referendum for Scotland to leave the UK and we consider the independence vote will more than likely to succeed. Scotland, especially Edinburg will be the primary beneficiary of the shift of financial jobs out of London. UK has always been proud of its arms length relationship with Europe however tradition will not cushion the country from the economic shocks as result of Brexit. We live in an interconnected world where London acted as a stepping stone into Europe. With Britan leaving the UK, the need of stepping stone is removed, Firms will create beachheads and head directly into the wider continent. It is a zero sum gain, where UK losses is made up by other European countries. The fall in the exchange rate is driven by the potential lower earnings in the future by its population as result of leaving. The weakness in GBP sterling rather than the strength in the US dollar is the primary driver of the fall in exchange rate. The negative view towards EU by the wider population made the vote to stay in the EU harder. The advocates of Brexit does not see the long term consequences of the exit from EU and we are still in the early stages of absorbing the shock. We expect the Euro to trade down alongside the pound in sympathy. On one side, Paris and Frankfurt will benefit from shift in European headquarters of multinational firms. But there will be greater political and economic risks in the medium and long run as other nationalist parties EU look to replicate the Brexit experience. Higher uncertainty in future will not leave wider Europe unscathed. It is important to note that the global risk of Brexit is overstated outside UK and Europe. While the global equity markets has sold off, we consider the greatest risk of traditional correction rather than a repeat of 2008/2009 wholesale bear market. While plenty of ink has been spilled on this issue, we do not expect wider financial contagion outside of Europe after the vote. UK is not important as many think it is. The key contagion risk is within EU it self. The early blow out of sovereign spreads in the PIGS countries are evidence of this. While the decline in Sterling will support the initial economic shock in the short run. For consumers, imports will be more expensive but lower GBP will make export more competitive. For investors if you hold capital in UK, the value of that capital will fall. The option market shows that considerable cost in hedging this risk. We expect equity sell off as volatility increases. FTSE 100 contain the largest 100 companies listed on the LSE. A large portion of the companies in index have a global presence outside of UK. A weaker pound means that foreign revenues will be appreciating while cost being constant. International UK firms will have increased profitability. This assumes that investor equity return will outpace the rate of currency depreciation. However could be worth while for long term investors that can use local AUD as collateral and borrow pound to buy equities. The FX risk is really the profit or loss on the trade. The exemption made for UK from the founding goal of “ever closer Union” as result of the deal means will be the start of the new era where there will be 2 speed Europe. Britain with its close proximity to Europe will be a second class nation in future politics and development of Europe. The flow of jobs from UK where a large number of multi nationals are headquartered will be moved to other European capitals. Long term risk to UK include the end of inflow of capital to London. Similar to Real Estate in Australia where the prices are a steep level beyond what the fundamental justify. There shouldn’t be any impact on our long term Australian dollar forecast. Weakness in housing sector in London will be another layer of complexity the UK have to deal with in addition with job losses, slower flow of capital (even capital outflows) and increase economic friction. One question we have is if Brexit positive or negative for Europe in the long run. This can have impact on the EUR and by implication the Euros to Australian dollar exchange rate. It will be interesting to see the trend in voter sentiment leading up to June.